Matt Laminating Pouches are a premium quality type of Laminating Film that reduces light reflection and glare and makes reading easier under bright conditions. Matt Laminating Pouches work the same way as normal glossy Laminating Pouches but produce a high quality matt or frosted finish. Ideal for use in outdoor applications where sunlight can reflect off the laminated document , making reading difficult, or inside applications where bright internal lighting bounces off normal gloss pouches. 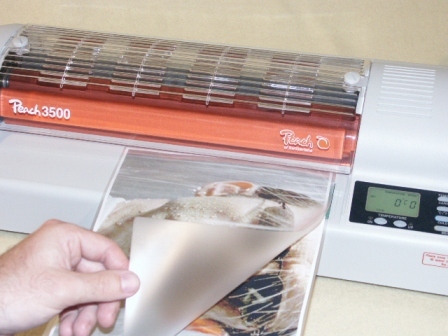 Matt Laminating Pouches remove the glare, as well as creating a professional look to all your laminated documents. 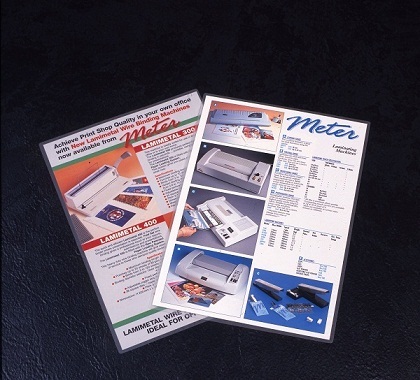 Meter premium Matt Laminating Pouches are made from a quality mixture of polyester and eva / glue – that produces a superior matt finish result and also lowers the risk of pouch jamming.The Matt Laminating Pouches are Matt on both sides (matt/matt) and suitable for use in all Pouch Laminators. Ideal for laminating all documents, signs, maps and training manuals, Matt Laminating Pouches provide a tamper proof finish and protection from dirt, grease and water as well as creating a pastel effect when laminating pages with gloss colours. Matt Laminating Pouches are available in boxes of 100 pouches and are 100 micron in thickness in a variety of sizes. Click on the links below for more information on individual sizes and pricing.